I am humbled to be nominated for my first ever blogger award....maybe the first award of any kind....ever! Barefoot and Flower both nominated me and I thank them both immensely for their kind comments on my blog, not to mention the peace (and laughs) that reading their blogs gives me. 2. Nominate 10 blogs with great attitude and/or gratitude. 3. Be sure to link to your nominees in your post. 4. 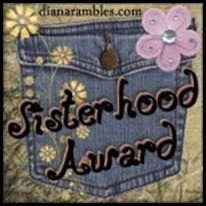 Let your nominees know they have received the award by leaving them a comment on their blog. And wow...I've even figured out how to do all this on my blog! Cool.